Peta is a very experienced horsewoman, a Fellow of the British Horse Society (BHS) which is the highest qualification awarded by the Society. She passed the Show Jumping Specialist Fellowship Exam, and has competed show jumping from novice level to Grade A level, including qualifying horses for and being placed at the Horse of the Year Show. She is also a BHS Chief Examiner, an NVQ assessor, and a Side Saddle Association instructor and judge. 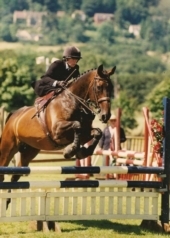 As well as having considerable experience at all levels show jumping she has Three Day Evented to International level, produced and ridden top show horses, and won the title of National Side Saddle Rider of the Year four times. She has worked as an equestrian expert witness for approximately 25 years, and is used by solicitors, insurance companies, and private clients. Peta currently competes mountain and moorland ponies, and also rides horses for clients, both at home to school them, and when asked will ride them at competitions. As a former lecturer at Hartpury College she has a Certificate of Education and is a trained lecturer, also giving lecture demonstrations. Peta is based in Evesham, Worcestershire, but travels extensively in the UK.